Mobile photographers might soon have the option of zooming in on their targets without the image degradation that comes with traditional digital zoom, if a new multi-camera optical zoom system spotted in a recent Apple patent application makes it into production. According to the application, Apple's system utilizes two cameras with different focal lengths. When users take a photo, the device would actually capture two images simultaneously. In some cases, Apple imagines capturing two still photos. In others, one camera would store a still image while the other would store a short video, similar to the existing Live Photo feature. Both images —whether still or video —would then be combined to create a new image depending on the user's zoom preferences. This system is not unlike that used to capture three-dimensional images, which is itself modeled on the way human depth perception operates. Multiple lenses (human eyes) see the same image from slightly different perspectives, and a computer (the brain) combines them to create a single view. A multi-camera —or at least multi-lens —iPhone has long been rumored. 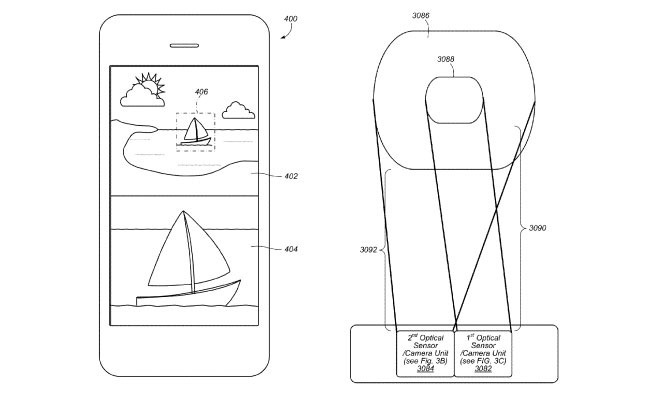 Previous Apple patents have detailed a single-sensor, multi-lens camera system as well as a multi-sensor 3D camera. Last year, Apple acquired multi-sensor imaging firm LinX Imaging for a reported $20 million. Apple credits Claus Molgaard and Iain A. McAllister with the invention of U.S. Patent Application No. 14/788386.